Of course this picture is fuzzy, because I didn’t take it. Daycare took it and sent me my son’s first real life encounter with his beloved and most favorite animal, the “Turler”. Some days are just blue. You think about what your kid is doing, while sitting at your desk miles away from them, then when you do see them, they have learned a new skill, or set of words, or trick, that you weren’t there to experience with them. 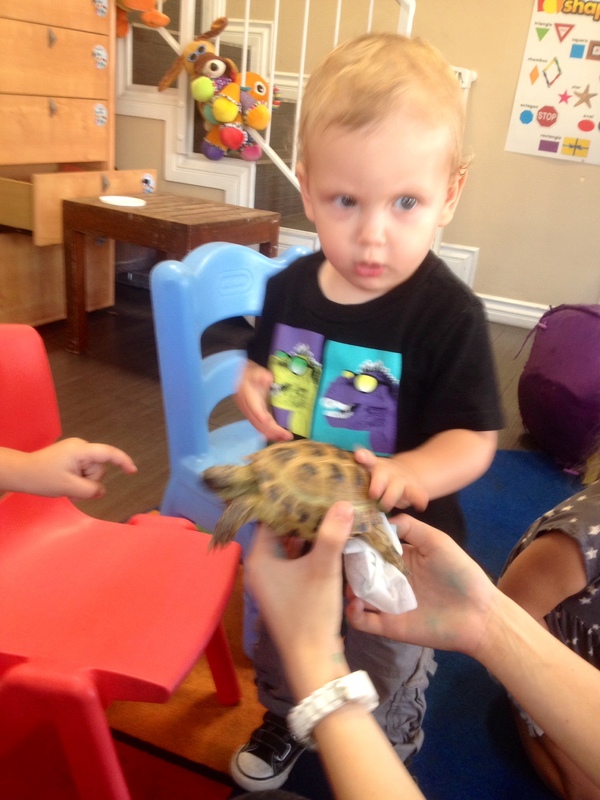 Or, you get a fuzzy picture from the daycare’s owner, of his first time touching a turtle, and you weren’t there. BLUE, I tell ya. Just blue… or grey. All of the “I’m being a good example to him by working to support our family” condolences are sweet, but some days, I just wish I could sit on the couch with him all day, with no outside responsibilities. Or, go to the park, or throw him in the stroller and go for a late morning walk (like all the moms I see on my route between daycare and the office), go to the beach when it’s not packed, go to a toddler gym class, music class or swim class at 11:00AM on a Tuesday (you get the idea), but that is just not the case. Four to five days a week, he’s in “school” from 9-5 while I work, giving us a mere 2-3 days a week to spend time together. That is a hard pill to swallow. I’m not one of those moms who just “can’t give up their career”, or “wouldn’t be happy being at home all day”… I work to keep our family fed. I’m not delusional either. I don’t think that staying at home is easier, and somehow that makes spending time with my kid/at home more enticing. That’s exactly opposite of what I think. There’s nothing about mothering that’s easier than being in my office all day. When I’m at work, I’m able to drink what I want, eat what I want, sit down to lunch like a human and actually eat my food while carrying on an uninterrupted conversation, pee by myself… there are a lot of perks to having the ability to go to work, but not one of those perks can replace the joy of witnessing my son smile so big at something new he’s discovered, or attempt to say new words (we’re currently working on making sentences I can understand. Today he said “more jelly” and I about burst). And yet, it’s a necessity. A necessity that comes with enormous sacrifices, and sometimes, those sacrifices leave me blue. I’ve often said the words “I hate that someone else is raising my child, while I’m at work” and continued down the big blue hole. While researching some mom blogs about how to make dinner prep time easier when you get home late and still want to salvage those precious 2 hours between getting off of work and bedtime, I found the encouragement I needed to continue on as a working mom, reset my understanding of my position in life, and leave some of the blue behind me. You see, until now, I’ve been a huge part of the perspective problem. I’ve convinced myself that I’m doing something wrong by being gone all day, and letting someone else “raise my baby”, but that’s just not true! NO ONE ELSE IS RAISING MY KID FOR ME. I AM. Our daycare teachers are not raising Remy for us. Not even when we had an in-home nanny, was someone else “raising” my kid for me. My husband and I raise our child. Together. Everyone else is paid to care for him in our absence while we’re at work, but like hell is anyone else actually raising our son for us. Last I checked, it was me he nursed from (still, at 19 months old), me who wakes up with him every morning and holds him as he goes to sleep at night. It’s my husband and I who feed him and wake up with him in the middle of the night. It was my husband and my bodies that made him, and my body that carried him for 38 weeks. We are the ones planning and scheduling and loving and caring for and holding and everything… except for a few hours a day, when our bodies are further away, but our minds… our minds and hearts are never absent. We rely on our amazing daycare for daily help, but that’s it. We are the ones who determine how he will be raised and the ones whose hands, arms, minds, and hearts do all the work to accomplish that. So, here I am… I initially started this post as a sad post about missing my son all day, and though I still am sad about missing him, and not getting to spend the time with him that I wish I could, I’m NOT sad because I feel like someone else is “raising him”, and I am not. Thank you Kerry and Kristina for your words of wisdom and understanding, while also helping to remove some of my massive mom guilt. Thank you for helping me understand that I’m the mom, and that the absence of being at work, doesn’t replace me or trump me as a parent. Thank you for going the road before me and for helping me through… Thank you for helping me see a positive and honest perspective on our situation. Thank you.